A recurring complaint lobbed against Depeche Mode for the better part of a decade has been the lack of urgency to their output. Their studio prowess has remained as sharp and of the moment as any synth-pop acts to follow in their impressive wake, but recent albums haven't exactly added any ripples that resonated like their best work. Listeners couldn't be blamed for thinking that the group had lost their ability to thrill, even if they still occasionally impressed. No such issue with their 14thÂ album Spirit. Like many albums recorded before but released after the Armageddon that was the 2016 election, it crackles with relevance and vitality in ways that might not have seemed so apparent a year ago, at least not right away. Off the bat, the lyrics on Spirit bristle at the world in which they arrive. "We are not there yet" is Dave Gahan's opening sentiment, an understatement if ever there was one. It sounds particularly admonishing when one realizes it could have played more aspirational just five months prior. The declarations only become more damning as things progress, with Gahan and Martin Gore taking turns chastising rights violations, the return "to a caveman mentality," and various other things that would almost feel like generic protest points if so much of it wasn't happening right now in real time. In midst of the riot act comes the second signature sentiment of the album: "We feel nothing inside." Boilerplate goth platitudes become painful when one of their top purveyors has to keep sincerely singing them over thirty years after trying to convince the world that people are people. Fortunately, the band has remembered to rock as well as rage. The sonics on Spirit find a sweet spot between 1993's soaring Songs of Faith and Devotion and 2001's simmering Exciter (so Ultra, basically). Lead single "Where's the Revolution" stretches the monolithic melody of the former's "Condemnation" like taffy into something that swoons and swaggers more with each listen, while the propulsive highlight "So Much Love" sounds like "A Question of Time" re-recorded for the latter. The album isn't perfect. Songs like "Scum" and "Fail" don't reveal much more nuance than their titles, and "So Much Love" is so comparatively perky that the rest of the album threatens to blend together in its slower seethe. But if current events have taught us anything, it's that perfection and subtlety aren't attainable anytime soon. 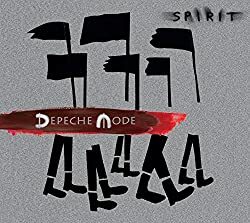 We need bands like Depeche Mode to go all in on subjects that too many people still need to be beaten over the head with, and we need them to do it with the sounds that made us fall in love with them in the first place. Music for the masses might still be the best medicine after all. **Donate $15 or more to Y-Not Radio this week to receive a download of Spirit. Click here for details.